When I attended EMU in the mid-to-late 70’s , I was fortunate to have some great professors : for example, Dr. Peter Holmes in Psychology , Robert Wright in Literature , and PGM Simone in Anatomy and Physiology . However, my favorite Professor by far was Dr. William Fennel ( Biology ). Simply put, he made freshman biology a great course. When I started EMU I didn’t think I’d ever be majoring in biology since I had such a strong interest in psychology. 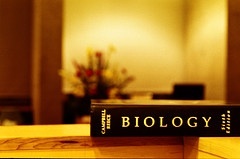 Thanks to Dr. Fennel, I ended up with a second major ( biology ) after first majoring in psychology. Although I never worked in the field of biology following college, to this day I maintain a strong interest in the discipline. I often read new (and historical) non-fiction works that have as a common denominator a link to some aspect of biological science. Creativity, Gangnam Style and Learning, All Rolled into One! Holman Success Center, Let Us Help You Succeed!